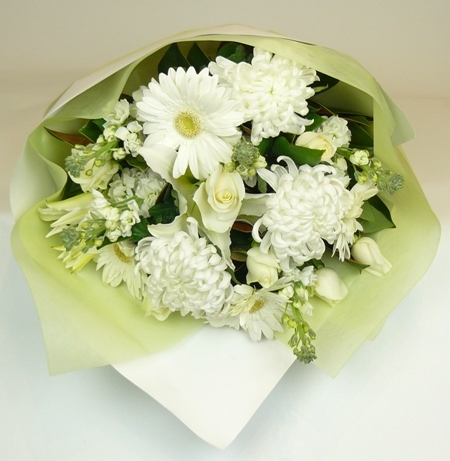 A beautiful classic bouquet in shades of whites and ivory. This elegant bouquet is roll wrapped in thick white paper, tied with ribbon and completed with a card. The flowers may differ to picture subject to seasonal availability but your blooms will be selected from this classic clean palette. Perfect bouquet to suit any decor and for any occasion - Sympathy, Birthday, Engagement, House Warming.